Commissioning a piece of art is the perfect way to acquire a completely unique painting for either your home or workplace. I do not reproduce paintings that have been commissioned so the painting will truly be a one off. I am often asked if I will work from a favourite photograph(s) I am happy to do this with one small caveat; either you own the photograph or have permission to use the photograph (I won’t plagiarise another artist’s work). How to commission a piece of art. The commission process starts with an initial discussion where you, the commissioner, gives me an idea of what you want, i.e., size, location, atmosphere, reason for the commission and importantly timescales. Commissioning is a collaborative process and I like to send regular updates to you to ensure that you are happy throughout the development of the artwork. This information forms the ‘brief’ and armed with this, I develop small thumbnails/sketches and send these together with a simple contract outlining the brief and confirming the cost and payment arrangements. If you are happy to go ahead and the contract is agreed I will begin work on colour study(s) for your approval. I then send regular updates of the work so you are able to watch it develop and we can tweak along the way. If you wish to discuss a commission please contact me. I've recently completed an interesting commission. The brief was based on one of my paintings seen at an exhibition. However the client wanted a specific view, but with the atmosphere of the original painting. I really enjoyed developing the painting and was pleased with the finished piece. I was also pleased that the buyers were delighted with the end result. The following images are reproduced with the kind permission of Jason who commissioned a painting as a surprise gift for his partner on their Wedding Day. The brief was to capture the wedding venue incorporating flowers to be used in the venue and button holes. Jason also used the words whimsical and romantic when we discussed the commission. The painting was 60cm x 90cm (2ft x 3ft) oil on linen. 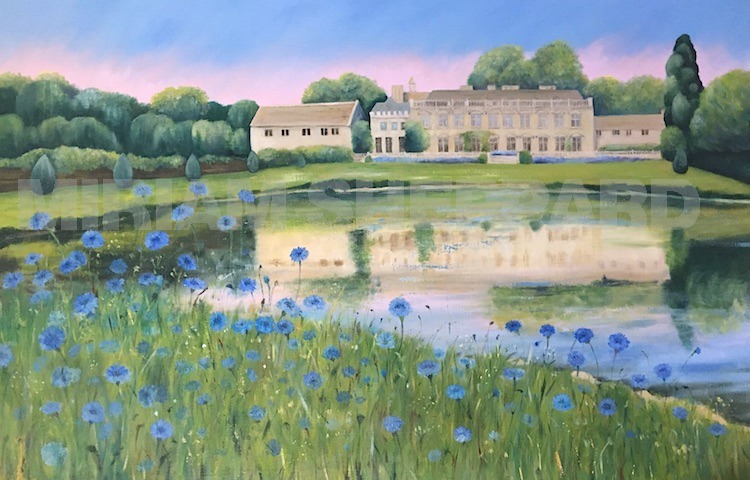 "Miriam's painting of our wedding venue was everything I hoped it would be, capturing the essence of the venue and giving the image a romantic hue. Miriam was a pleasure to work with and really understood my vision which she successfully represented on canvas. The invaluable help in choosing the right frame also appreciated."